One of the very best things about my career as a marine biologist is that I never know what to expect. Sure, I spend about 40 or 50 hours a week staring at a computer screen, but there are times when I walk into the office one morning and get invited to do things like help teach a field course on marine biology, help disentangle whales, or even visit a beach where a Japanese boat has washed up. But what happened in November 2015 is a memory that will stay with me forever. Sometimes in science you get so busy and engrained in your work that you are loathe to take any time off- including weekends and evenings. This can happen for months at a time. But when somebody tells you that the first blue whale ever has washed up on an Oregon beach 3 hours south, there isn't much you can do besides get up at 4 in the morning and drive there at your first chance- which is exactly what I did! 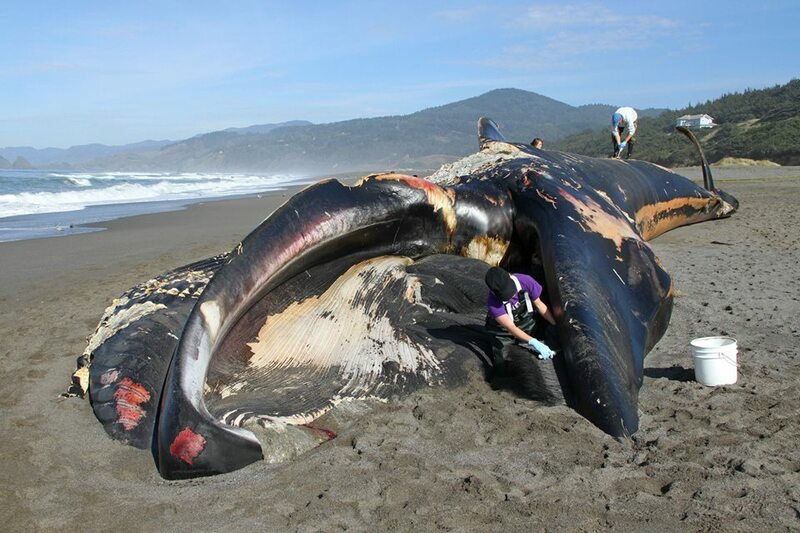 Sometime in the hours between November 2nd and 3rd, 2015, an adult blue whale- the largest animal to ever have lived on planet earth- washed up on Ophir Beach, Oregon. Ophir Beach is a secluded beach between Gold Beach and Port Orford. The whale was a 75-foot long male; meaning it was a small mature adult and weighed somewhere between 60 and 75 tons - meaning 120,000 pounds, or more than the size of 10 of the biggest elephants. News reports, of course, put the whale at 100 tons, which is an overestimate for this animal. Two things told me I had arrived at Ophir Beach- an unusual number of cars parked in a pullout in the middle of nowhere on Highway 101- and the smell. Before I could even see the whale, I could smell it; it was a mixture of what I always thought of as a 'concentrated ocean' smell and the unmistakable odor of decaying marine mammal. Upon getting out of the car and heading down to the beach, the wonder of the moment caught up to me. Down by the tide line, laying on its side was the most beautiful, incredible and tragic animal I had ever seen. My feeling of elation as a biologist was mixed with sadness for the animal and its fate. I have never been both so solemn and in wonder of nature at the same time. My first look at the whale. Oregon Marine Mammal Stranding Network Coordinator, Jim Rice is there to greet me! 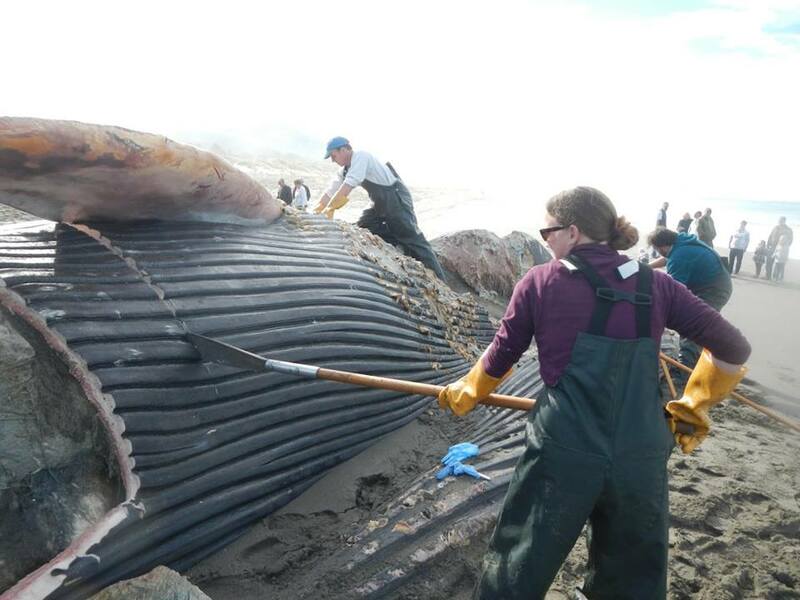 Upon getting set up and donning protective gear (gloves, waterproof bibs, boots, hat) I set up for my first task, which was to remove the baleen so that it could be used for a research project studying the dynamics of feeding in baleen whales. It was a race against the tide, so I spent the day in the mouth, sitting on the tongue of the world's biggest animal. 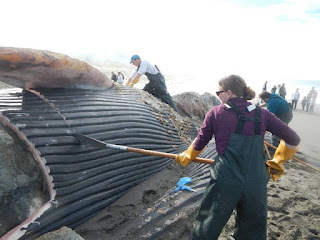 Removing the baleen involved a strong stomach, lots of muscle, and hand tools in a rush against the tide. When whales wash up on beaches, one of two problems often arise: 1) these large animals attract large numbers of people, presenting health and safety hazards for attracted beach goers. The two days I was there, and surely for the rest of the week, people were running across the highway to access the beach. Additionally, many marine mammals (especially decomposing ones) can carry diseases that are easily transmitted to humans or pets such as dogs. The second problem is that, while the animal is certainly neat for a day or two, sooner or later the stench of decay and the prospect of removing such a large rotting animal becomes worse by the day, often causing complaints. Therefore, stranding networks are often presented with the options of removing the animal from the beach or burying it. In the case of Big Blue (my name for him), the opportunity to salvage the skeleton as a display for generations to come was too good to pass up. There are few places that have articulated blue whale skeletons, but they are an amazing sight. 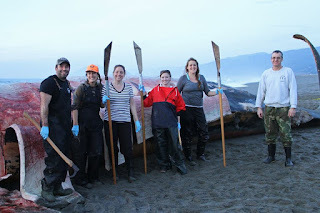 Therefore, a team of hardy, resilient and optimistic volunteers worked all day long for over a week- mostly with hand tools- to strip down the carcass before the ocean (or beachcombers) could break it down. After removing as much of the baleen as we could the first day (we worked right up until the tide moved back over the whale), I and others began 'flensing' the blubber off the whale- removing it in strips- so that we could get at the muscle tissue, perform a necropsy to discover how the animal died, and finally get to the bone. Flensing is hard, endless work that would have been much harder had we not had a designated knife sharpener! 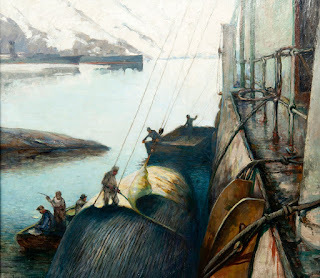 As brutal as the commercial whaling industry was (and still is), I gained some respect for the men that would do this job for often hundreds of days at sea; instead of working on a whale on the beach over several days, they would have but a few hours to climb on the whale hoisted to the side of a moving boat, and somehow remove the blubber without falling into the water. Comparatively, we had it easy. "Whalers' Bay" by Carl Dørnberger shows whalers flensing a whale off the side of a boat (1920). They did not have the benefit of vinyl rain gear or peanut butter sandwiches during breaks. Not much has changed in terms of method in the last 95 years...however, we now use stranded whales for public education and conservation rather than harvesting them. I grudgingly had to return after two days of helping because I had my upcoming qualifying exams for my doctorate in two short weeks. 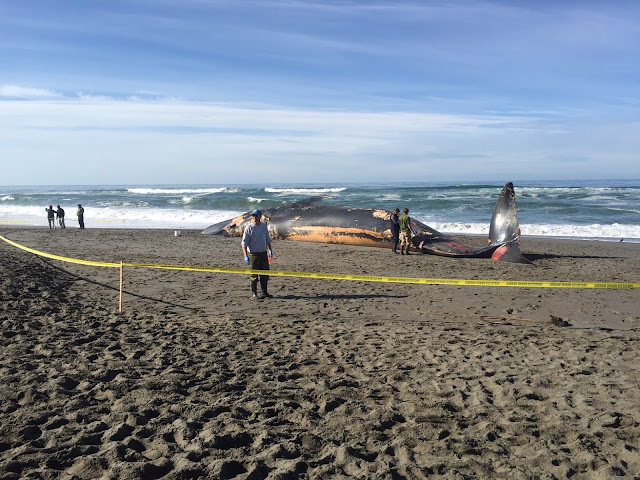 However, there are lots of folks from many different institutions, including students from Oregon State University, Oregon's Marine Mammal Stranding Network, and Humboldt State that worked tirelessly to make this happen. Along the way we answered the questions of curious beach goers and somehow completed the whole effort without a major injury (I very nearly took a mallet to the face). (And the smell did not improve over time. The deeper we got and the more we removed, the more rotten it became. Within a couple of days after it was removed, it would have been a rotten blob of tissue on the beach, lost to the tide and scavengers (there was a bear sighted nearby while we were working). This photo was taken at the end of the first day. Notice the oil coating my overalls. This permeating oil -originally what whales were harvested for- is something that never, ever washes out and the smell remains. All in all, what would be unthinkably smelly or gross work for some was an amazing biological opportunity and a lifetime experience for me and many others. I wonder what that whale saw during his lifetime, how his last days came to play, and how old he was. I'll never forget that first moment when I walked on that beach, or what if felt like to stand, dwarfed, under his towering tail fluke. Some of these questions will be answered- for example, he was an extremely thin animal- and others are left up to the imagination. The best outcome of the whole event is that by preserving his skeleton, people for generations to come will be asking the same questions. Standing by the tail of this beautiful behemoth. This 75-foot whale was approximately 3/4 the size of the biggest adults, which can reach 100-feet in length. All of the workers on this project were working purely out of a volunteer basis- we all showed up out of the sheer excitement of the opportunity and experience. In fact, the Oregon Marine Mammal Stranding Network nearly lost its funding a year ago due to government cuts. Without our stranding coordinator and volunteers, nobody in Oregon would be able to respond to calls like this of stranded animals. If you'd like to learn more about the OMMSN or the Marine Mammal Institute, you can visit the webpage at: mmi.oregostate.edu.